Bass clarinetists Samuel Dunscombe (far left) and Curt Miller perform Pierluigi Billone’s “1+1=1” on Friday at 808 Gallery. The next night, just up Commonwealth Avenue at the university’s 808 Gallery, another drama of sorts transpired. Samuel Dunscombe and Curt Miller, both on bass clarinet, might have been enacting the same script at the start, but separated by a distance of 15 feet or so, their concord was approximate. Over the span of 70 minutes, and well before the players’ speaking voices transformed the event — Vladimir and Estragon, maybe, muttering at one another to no evident end — this performance, too, was awash in vocal resonance. 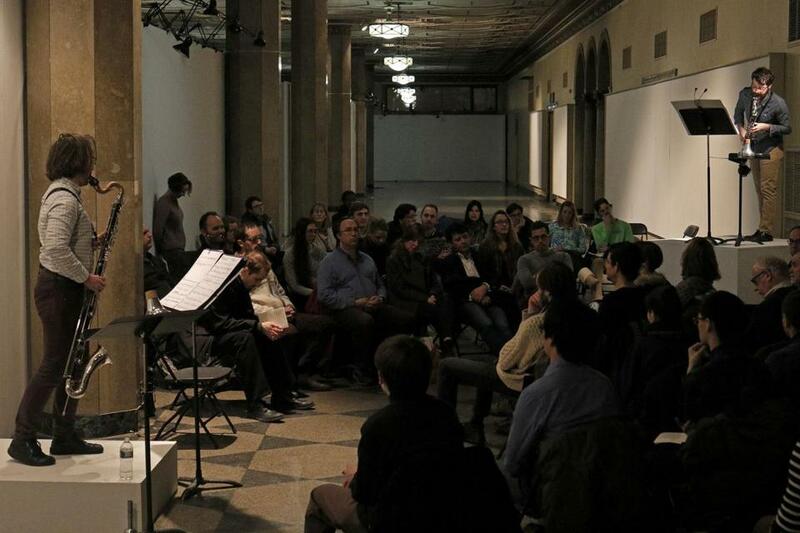 Both events were presented by Boston University’s Center for New Music as part of a residency by Pierluigi Billone: Italian-born, Vienna-based, a student of Helmut Lachenmann and Salvatore Sciarrino, and by broad acclaim one of the more significant composers to arise in this young century. During his stay, which started on March 16, Billone is participating in a series of concerts, master classes, lectures, and workshops, all open to the public and presented free of charge. Like his boldface-name teachers, Billone relies extensively on unorthodox sounds produced with unconventional techniques. Lachenmann’s capacity to shock with visceral novelty is evident. So, too, is Sciarrino’s affinity for a chiaroscuro of sound and silence, and knack for dramatic potency. Still, there is something new and singular in Billone’s work: a capacity for drafting pieces that can sound elemental and primordial, yet at the same time relatable and achingly human. The point was made resoundingly in both concerts last week. True, instrumental method accounts for some of the strangeness of “ITI. KE. MI.” (“New moon. Mouth. Feminine.”), which Fusi played on Thursday. The violist Barbara Mauer, for whom Billone created the 1995 work, describes in a program note provided at the concert Billone’s long period of studying the viola, and of working with Mauer. The research is telling: The viola is restrung and retuned, to alienating effect: a contraption of wood and metal, made to sound with thuds, plucks, feathery rubs, and grating scrapes. Subtle vocalization is required as well. Those techniques are common enough among devotees of free improvisation, but Billone achieves a twofold alchemy: first notating those sounds with a mix of conventional staves, graphical cues, and color codes, and then sequencing them in a manner that transcends shock to reach awe. Fusi, showing no sign of being taxed apart from a gently furrowed brow, played with all the poise, precision, and passion needed to make the encounter mesmerizing, unforgettable. For context and contrast, he played violin works by two more iconoclastic Italians: Giacinto Scelsi’s “L’Âme Ailée — L’Âme Ouverte” (1973), molten and obsessive, and Sciarrino’s “Sei Capricci” (1976), virtuoso whimsies unusually direct in utterance and charm. “1+1=1” (2006), the piece that Dunscombe and Miller played on Friday, is in some ways even more demanding of its listener. Named for a notion from Tarkovsky’s “Nostalghia” — “One drop plus another drop makes one larger drop, not two” — the piece is less encountered than entered into: The players are distanced from each other, close enough to make eye contact but far enough to envelope an audience. In an essay about the piece, Billone evokes an archeologist learning how to dig in order to discover the unknown. Fitting, then, that at 808 Gallery, Dunscombe and Miller stood atop platforms meant for display of precious objects. Their gassy whispers, whale-song chirrups, and elephantine rumbles flowed at a conspiratorial hush, broken up without warning by clamorous howls and slap-tongued pops. Sounds swelled in the long, tall, narrow space, caroming off hard walls and lingering in far corners. As the piece winds on, bursts of speech come with increasing frequency: their meaning obscure, their presence uncanny. True confession: Anyone who maintained absolute focus for the work’s full span is a better listener than I. Like George Herriman’s surreal “Krazy Kat” landscapes, “1+1=1” is a vista in which to dwell — and by which to be repeatedly jarred back to alertness. The performance was superb, Dunscombe and Miller demonstrating impeccable technique and copious imagination. Two concerts remain in Billone’s visit, a bassoon recital by Christopher Watford on Tuesday and a final program by Sound Icon on April 1. Both are emphatically recommended.